Canada-based maritime battery manufacturer Corvus Energy today announced a new multi-year agreement with Korea’s LG Chem Ltd. (LG Chem) that will see the Seoul-headquartered company provide lithium-ion pouch cells for Corvus’ next generation maritime energy storage systems (ESS). The new systems will launch some time later in 2016. 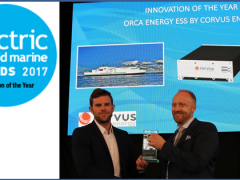 “We are excited to provide to our customers a step change in cost-per-kWh for purpose-built high quality maritime ESS solutions” said Andrew Morden, CEO of Corvus Energy. 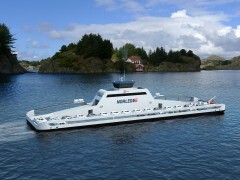 “LG Chem is very focused on success in the rapidly growing marine market and we know that success takes not only cost-effective energy storage components and deep customer relationships, but also application-specific engineering to ensure the energy storage is designed for a smooth integration, long-term durability and safe operation aboard a ship,” said Chris H. Cha, Team Leader Marine TFT, ESS Marine & Offshore Applications, LG Chem. In January Ship & Bunker reported that a validation process had demonstrated “vastly improved” product specifications of Corvus’ lithium ion battery systems than previously reported.